Set in the gritty backdrop of early 1980's New York City, Bizzy Biz 136 introduces you to the young B-Boy Biz, his older brother and budding local street Dj, Kev, fellow graff writer and secret crush Foxy and many more of his neighbors, friends and foes as they all take part in each of the four elements of Hip-Hop: Breakdancing, Graffiti, DJ-ing, and Emceeing. With a smooth and easy to read rap, Biz narrates you through a Hip-Hop filled day in his boogie-down Bronx neighborhood. The story, characters and much of the illustration work in Bizzy Biz 136 were originally created for The Hip-Hop Pop-Up Book which explains "paper cut out" approach to the design and artwork. 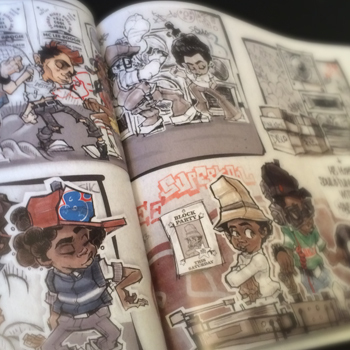 Bizzy Biz 136 is a fresh, light hearted graphic novel that celebrates the original spirit of Hip-Hop. 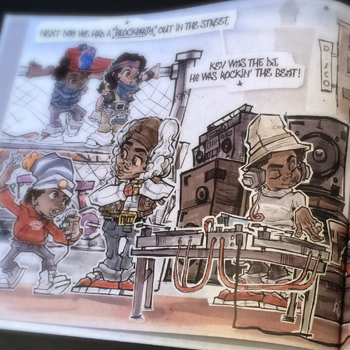 The book contains stylish illustrations and a warm hopeful original story written with the help of Hip-Hop pioneer Grandmaster Caz - that sheds light on the positive energy that the Hip-Hop movement provided during this era, when oppressive living conditions gave way to creativity, self-expression, opportunity and most importantly, community.